I like pumpkin pie, but I don't LOVE pumpkin pie. If I am being completely honest, I like the crust and the whipped cream with just a little bit of pumpkin pie in the middle. My grandfather always used to tell me I should have some pie with my whipped cream. I think that is why these pumpkin pie bars appeal to me. A lot of crust and a layer of pumpkin pie that isn't actually pie size. The gingerbread crust sounds pretty yummy too! You just need to add some whipped cream. 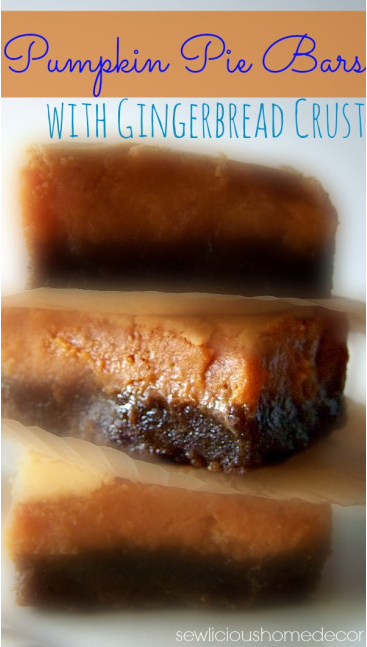 You can get the pumpkin pie bar with gingerbread crust recipe over at Sewlicious Home Decor.